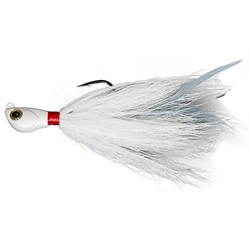 Owner's Bucktail Shad was designed to mimic a struggling gizzard shad. This Hair jig is hand tied and finished with an epoxy to secure the wrap. The Bucktail Shad features a living eye, vertical line tie, and a super Needle Point Hook with black chrome finish.